Bragging rights aren’t the only reward for doing a race. Having a finisher’s medal draped around your neck at the end is a wonderful feeling. A medal is a celebration … validation … a form of proof, if you will, that you not only completed the distance but also (unless you’re a freak of nature) spent a lot of hours preparing to complete the distance. Wear them proudly! This entry was posted in Race stories, Uncategorized and tagged Bragging rights, half marathon, marathon, medals, race bling, race medals by Walk With Joelle. Bookmark the permalink. 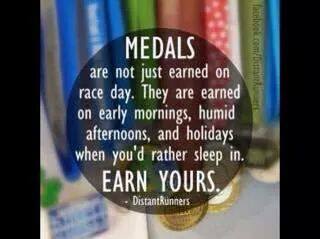 Wearing your medal after you finish your race makes you feel INVINCIBLE!